The best online gaming websites in the world offer players a sportsbook, a casino, a poker room, and Bingo at one website. William Hill is one of those online gaming site. This makes William Hill a great choice for the avid gambler who’s well-versed in placing wagers. William Hill makes it easy to transfer money from account to account. As a matter of fact, players may even trigger first deposit bonuses via transfers! Each sector of William Hill has its own bonus that it offers new players. Players can claim these bonuses via a deposit to that specific channel or by transferring from one sector to the next for the first time. For example, a player is eligible for a poker bonus since they haven’t deposited or transferred to their poker account. This bonus can be triggered by depositing in the poker lobby or by transferring from one of the other channels. However, multiple bonuses at the sametime across different channels are not allowed. They must be cleared one by one. NUTS: This welcome package has a bit of everything – cash game and tournament tickets, free bonus cash, and even free casino spins. BEATS: The overall amount isn’t as high as other rooms. 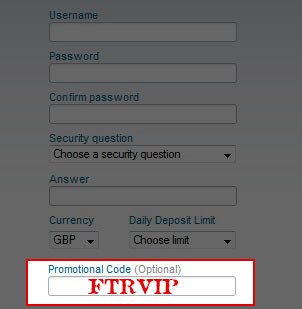 Use the William Hill Poker Promotional Code FTRVIP when you register a new account to activate the bonus described below. 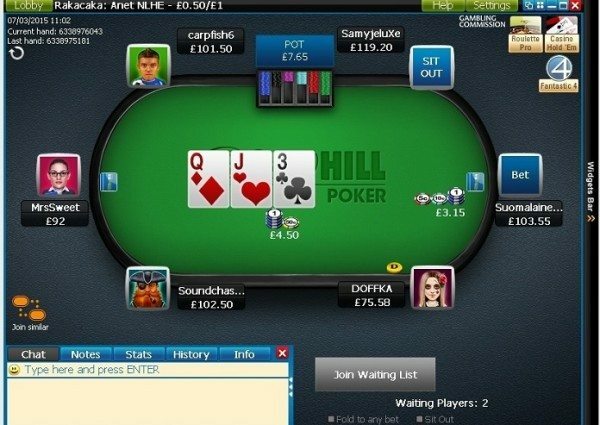 William Hill Poker offers new poker players a Welcome Package composed of a £7 Cash Game Ticket, £3 Tournament Tickets, £100 Bonus Cash, and 10 Free Casino Spins. General: £10 minimum deposit required. No code is required to trigger the bonus. £7 Cash Game Ticket: Ticket is given to the player immediately after deposit. The ticket is cleared once 85 points are earned. Must earn the points within 7 days. £3 Tournament Tickets: 4 SnG tickets given to player which can be used on specific ladder and twister tournaments. Tickets are given immediately after deposit. No clearing requirements. £100 Bonus Cash: Released in £5 increments. 280 WHPs per £5 for the first £10, and 350 WHPs per £5 for the other £90. Must be cleared within 45 days. 10 Free Casino Spins: Used on slot games within the poker client. Winnings must be wagered 40x. Max winnings cap is £20. 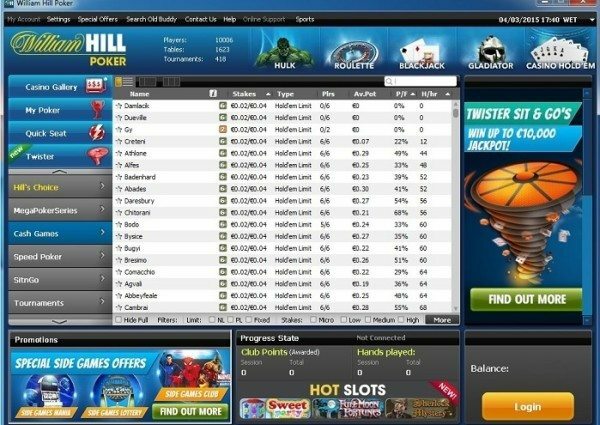 Our review of the William Hill Poker Promotional Code breaks it down even further, including multiple currency options. Clearing the entire bonus is fairly simple for anyone. Since there is a total of 45 days, literally anyone will be able to fulfill the requirements. On a scale from 1 to 5 with 5 being the easiest, this poker bonus earns a 4. 100% up to £300 — Automatic bonus with our links! NUTS: William Hill offers a respectable £300 for its new casino players. The bonus carries a fairly good wagering requirement, 30x. BEATS: Players are given only 7 days to clear the entire bonus. There is no William Hill Casino Bonus Code to be entered, the bonus is Automatic with your first deposit. Players looking for a casino experience are also eligible for a first deposit bonus. This bonus is automatically given to players that use our links; there is no bonus code necessary. The amount of the bonus is 100% of the size of your first deposit up to a maximum value of £300. Before making a withdrawal, you’ll have to play through the sum of your deposit and bonus 30 times over. See our William Hill Casino Bonus Code page for more details on the William Hill Casino bonus. None required. Automatic bonus with our links! NUTS: The sportsbook bonus is pretty straightforward. There are no terms & conditions to consider. Players simply get a free bet worth up to £/€25 after placing their first bet. BEATS: Deposit bonuses at other sportsbooks are generally better than this free bet offered by William Hill Sportsbook. Use the William Hill Sports Promotional Code F25 when you register a new account to activate the bonus described below. All players are eligible for a free €/£25 bet. 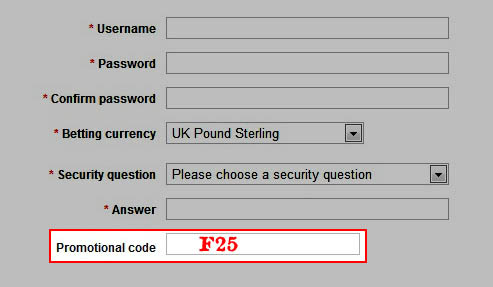 Players simply need to open a new sportsbook account using the F25 bonus code and place a bet of €/£5 or more. After placing the bet, William Hill will reward the player with a free bet of the same value up to €/£25. Free £25 for £10 Spent — Automatic bonus with our links! NUTS: The William Hill Bingo promotion is easy to understand and easy to clear. Players receive an £25 to spend on more Bingo Cards after buying £10 worth of Bingo cards. There are no stipulations to worry about. There is no William Hill Bingo Bonus Code to be entered, the bonus is Automatic with your first deposit. The William Hill Bingo Hall has a special promotion for new Bingo players. A player that spends £10 on Bingo cards within the first 7 days of account registration will receive a bonus £25 to spend on more Bingo cards. There is no bonus code necessary. Unlike other casinos, William Hill does not require new players to continuously deposit in order to spend their Bingo bonus money.